Nexia has made it easy to be in the know and in control of your home – even when you’re constantly on the go. An all-in-one app that connects your smart devices through Z-Wave technology, Nexia streamlines the way you manage your day. The Nexia app when used with a compatible American Standard Thermostat allows you to connect and control all of the heating and cooling elements of your smart home, creating a truly seamless system. Customizable and easy-to-use, the app allows you choose how your smart devices work together by creating automations and user modes. The Nexia app provides a powerful solution to simplify how you heat and cool your home. Take control of your home’s heating, cooling and energy usage with an American Standard Thermostat. 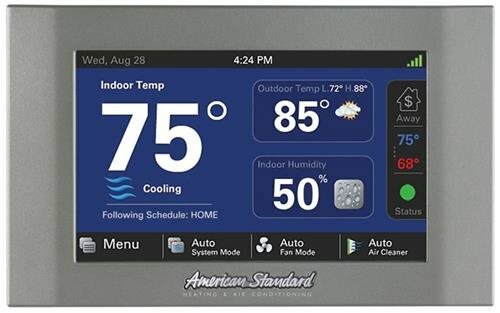 The intuitive interface and powerful features incorporated into the compact design of the color touch-screen control represent the latest in climate control technology from the industry’s leader in residential HVAC systems. And best of all, you can monitor and control your home’s climate from anywhere when connected with Nexia. Come home to your ideal home environment with Nexia Home Intelligence. Reduce costs by setting up a schedule or putting your comfort system into an energy savings mode when you are away. Easily change the temperature before you arrive of if you forgot to set it before you left.